spotted this family of five on my way home. mom-kid1-dad-kid2-kid3 all on their bike. its not a very safe way to get around, but a lot of families with young kids still do this. the buses are probably too crowded, too slow, or just not very convenient, and the ricks may be too costly, considering all the traffic jams. the kid in the very front had his head down for all the time that these people were in our view. mom thinks that he's going to have to keep his head down for the entire journey, else he'll block his fathers view of the road. if that's true, then its sad, as well as scary. We saw something close to this on the Cook Islands way back. Sure cuts down the carbon footprint, I say. lokks funny but its a serious things and dangerous. I saw a guy fetching 2 teenage boys in school uniform on his bike last Fri on the highway. I thought that was dangerous. But seeing this photo, it's deadly, for sure! And how all 5 managed to fit onto one bike! 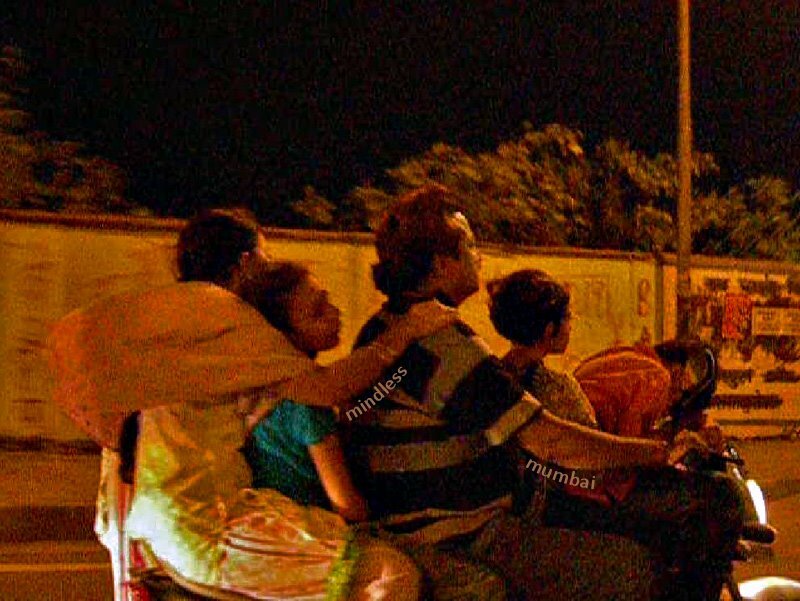 Not only does this look scary, but are there no helmet laws in India. At the very least, if people are going to travel this way, a little head protection might go a long way. thats dangerous!but its so common in India,isnt it? Common in India and other parts of Asia as well. Does anyone count how many road deaths occur there? still quite the same mumbai i saw in 2004.
very dangerous. Try this at your own risk.